News Americas, BELIZE CITY, Belize, Tues. Nov. 10, 2015: Weed may be legal in some U.S. states, but the federal government is doing its part to help tamp down on cannabis growth in the Caribbean region. The U.S. Army’s Southern Command recently teamed up with Belizean security forces to help eradicate over 50,000 marijuana plants in the Central American nation. Belizean security forces members recently boarded U.S. Army CH-47 Chinook helicopters in a marijuana eradication mission that occurred late last month in Belize. 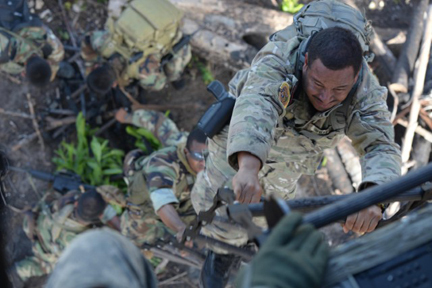 The Belizean security forces and U.S. Army operated together during the four-day mission to destroy thousands of marijuana plants during Operation CARACOL. The purpose of the operation was to build upon the counter-drug partnership between the U.S. and Belize, and put Belizean security forces in the front seat in terms of establishing potential areas where marijuana farms might exist, determining their impact to the drug trade in the region and then eliminating fields they identified as targets. Cannabis is illegal in Belize and so with any activities related to it. Presently, the laws make it illegal to carry weed in any amount. Anyone caught may be imprisoned for up to 3 years or may be imposed with a fine of up to 50,000 Belizean dollars. However, the government said that they are exploring the probability of decriminalizing the possession of marijuana in smaller quantities. The prices for marijuana in Belize usually will go around $5 to $10 for 1/8 of medium-grade. You can pay up to $15 for a quarter pound- schwag and buy a few grams of medium to high quality cannabis for only 5 Belize dollars. Bud is the common marijuana form being trade, ranging from low quality to medium and high-grade. Compressed bricks are also available on selected dealers. Belize society generally tolerates the use of cannabis, though the police enforce the laws criminalizing it. The National Drug Abuse Control Council reported that there was an increase in the use of marijuana in 2013, while “crack” cocaine remained the second most abused drug. Synthetic drugs are not widely used or manufactured in Belize, but are trafficked through the country, along with their chemical precursors. The US insists that Belize is a major transshipment point for cocaine and precursor chemicals used in the production of illicit drugs according to the State Department. The country is susceptible to the transshipment of illegal drugs due to its position along the Central American isthmus between the United States and drug producing countries in South America. Large stretches of unpopulated jungles exist on its borders with Guatemala and a relatively unpatrolled coastline that includes hundreds of small islands and atolls makes it difficult to conduct interdictions. Remote jungles provide a hospitable environment for the growing and transferring of cannabis. And Belize is bordered by countries where the drug trade is controlled by well-organized and extremely violent drug cartels. Despite enhanced efforts by the Belize Coast Guard and the Anti-Drug Unit to monitor coastal waters, both organizations continued to be hampered by limited funds, equipment, and lack of personnel. Belize’s counter-narcotics efforts are also adversely affected by corruption, deficiencies in intelligence gathering and analysis, an antiquated judicial sector, and a lack of political will, the US claims.